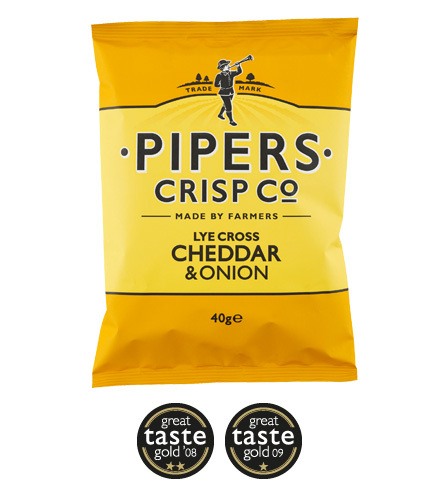 Pipers Crisp Co appear to be missing an apostrophe, otherwise there wouldn't be a Piper on the top of the bag! Grammar policing aside, the flavour colour coded bags are highly visible on shelves. The London Underground style font is timeless. We would prefer the flavour name was made more of, but overall it is a very effective and traditionally modern (if there was such a thing), look. A Munch Timing Test saw fifteen seconds worth of munching on a large Crisp. The thickness of the Crisps meant that the crunch was not brittle and hard, as you may find with American batch fried style Chips, but neither was it crispy and smashy like regular Crisps. There was a sustained meaty crunch throughout the life-span of each Crisp. These were really quite thick Crisps. Even the oil bubbles looked meaty. The only crumbling going on here was the seasoning, and there was also plenty of that. The colouring was a random oily yellow with orange seasoning spread unevenly about. A Nose Plunge Test revealed Cheese. It was not a generic Cheese smell either, which would suggest that whatever 'Lye Cross' is, it may be present somehow. The was also a very sincere and straightforward combination of flavours. There was creamy potato. There was a hint of Onion. There was a mild, but enjoyable Cheese taste. There could have been a bit more Onion to make the combo work a little better, but that should not detract from a very enjoyable Crisp.